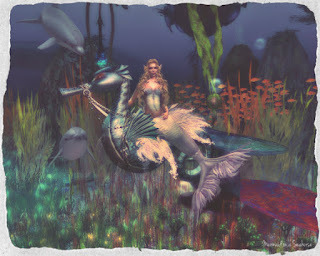 Fantasy Faire ends today and I still haven't finished exploring all of it, but while I was checking out the shops on The Rose sim, I found this pretty mermaid outfit for the Relay for Life from DeviousMind. The Seahorse came from the same shop and is a gatcha item. You still have a few more hours to explore the Fantasy Faire sims.